Whenever we plan for a short break within the UAE, Ed and I often book a hotel promotion that includes accommodation and activities. It is a tested and proven way to save money as packages are offered at discounted rates. There are several good offers out there. We're actually spoilt for choice here, but choosing a perfect package depends on our staycation goal. If we need is to de-stress, we would search for a beach hotel package inclusive of aromatherapy massage. If we're celebrating something special, we would likely consider a romantic package of hotel stay, dinner and bubbly. But if our goal is to go on a weekend adventure, accommodation and theme park tickets are a perfect match! And for this hotel stay and adventure combo, we recently came across an amazing offer in Abu Dhabi. We were in Abu Dhabi last weekend to experience Centro Al Manhal's Farah Experience Escape Package aka Yas Island Parks Escape. It is an excellent bundle of adventure, relaxation and good food! Let's go through the package inclusions one by one. Centro Al Manhal is a lifestyle business hotel tucked in the heart of Abu Dhabi. The location is convenient for us who came from Dubai via the public bus. We simply have to walk from the bus station to the hotel; hence, after a short stroll, Ed and I already found ourselves in Centro Al Manhal's stylish and modern lobby. The check-in process was smooth, and since we booked the escape package, the inclusions were thoroughly discussed with us at the front desk. In no time, we received our room key and park tickets! We dropped our bags and ventured out to Yas Island for a day of adventure! The package includes access to Yas Waterworld and Ferrari World Abu Dhabi for two adults. For families, tickets for the kids are available at special rates in the hotel. Ed and I have been to both theme parks before, but we still couldn't deny the excitement. My husband is a thrill-seeker, so he's mostly looking forward to trying out the extreme rides the second time around. Yas Waterworld is an Emirati-themed waterpark. The concept is based on the Arabic folklore - The Legend of the Lost Pearl. The sprawling waterpark has 45 rides, slides and attractions; five of which are the first of its kind in the world! Ferrari World is an indoor theme park built in tribute to the Ferrari! So, expect nothing less than excellence and phenomenal innovation. Take for example, the Formula Rossa! It is the fastest roller coaster in the world and could make one feel like being in an F1 car at a max speed. Centro Al Manhal's Farah Experience Escape package also includes a money-saving 10% discount on our food purchase in both Yas Waterworld and Ferrari World Abu Dhabi. Just like our first visit a few years back, we had our lunch at Dana's Diner in Yas Waterworld. We were very pleased that the dining outlet already offers dishes other than the typical theme park food. We had a delish meal of Shish Tawook, falafel, salad, fries, rice and drinks! It is a group meal that can be shared by up to 4 people; quite a steal for its price and additional discount. Booking Centro Al Manhal's escape package also entitled us to a 10% discount in park merchandise. We rarely shop for items whenever we travel, but this offer would be great for the families who want to take home plush toys for the kids and for those who want to purchase souvenirs. The package is tailored to give a worry-free vacation. Free locker usage is provided in both parks. Knowing that our bags are safely kept, Ed and I totally enjoyed our time in Yas Waterworld. The park, the whole UAE actually, is pretty much a safe place, but it is always best not to leave things unattended. Locker rentals start at 40 AED; hence, this package inclusion saved money off our pockets! After a fun-filled day in Yas Island, we headed back to the hotel for a much-needed rest. I was glad to know that apart from the park discounts, we're also getting 15% off in Centro Al Manhal's c.Mondo bar and c.Taste all day dining restaurant. We don't have to go out for dinner! c.Taste is a casual hotel restaurant serving international food for breakfast, lunch and dinner. The restaurant's themed night dinner buffets are quite famous in the capital. It's Tagalog night every Thursday, Arabian every Friday and International every Saturday. We went there on a Friday evening and we were amazed with the options. There's a live cooking station for grilled items, and abundant choices for starters, main course and dessert. Every dish was finely prepared and beautifully presented. I personally loved the beet hummus, the special kibbeh and the mahalabiya with caramel! And not to mention, the quality of service is just as excellent! I also came to know that c.Taste has an ongoing Buy 1 Get 1 Free promotion on the dinner buffets until February 28, 2017. That's an unbeatable deal! An essential part of the package is the buffet breakfast. Centro Al Manhal is a budget-friendly hotel that never skimp on quality! The breakfast is extensive and caters for all preferences! Aside from the hotel breakfast basics, there are detox fruit drinks, eggs benedict and manakish. This is my breakfast plate, but there's so much more options in the buffet. One of the best things in Centro Al Manhal's escape package is the possibility of checking out as late as 4:00 PM! It is subject to availability, but if you get lucky, you'll get more time to enjoy the hotel recreation facilities. There's a pool and gym in the 20th floor, and a good view of the city as well. Or you can use this time to laze around in your Centro Room. We stayed in a classic queen room in the 8th floor. Although it is probably the most affordable in the room categories, it is designed to provide the utmost in comfort. It has a double bed, a compact bathroom, bathroom amenities, coffee and tea making facility, iron, refrigerator, flat screen tv and free high-speed WiFi. It basically has everything we need and more! Most important feature of the room: Comfy hotel bed! The room is cleverly designed; compact space maximized! It even has a couch and a coffee table! For those who are into aerial shots, the view from the hotel rooftop is an added bonus! What more can say? This escape package is a jackpot! 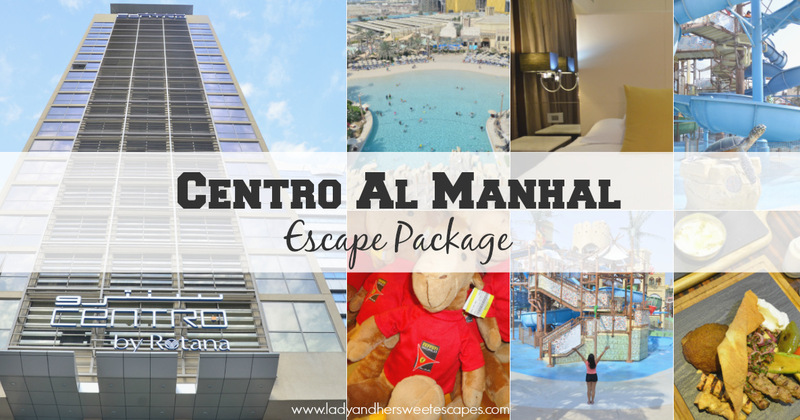 For the package rate, kindly check Centro Al Manhal's Rotana Escapes promotion. We were invited to experience Centro Al Manhal's Farah Experience Escape Package. Opinions in this blog post are my own.